Sukkot, Judaism's Feast of Tabernacles, follows quickly after Rosh Hashanah and Yom Kippur. That means there is a lot of holiday cooking (and eating) to do in a short amount of time. Fortunately, it is possible to devise menus full of special, festive and seasonal recipes that are both quick to prepare and easy to serve in a Sukkah. All of these recipes are great for an easy and delicious Sukkot dinner. They all showcase the seasonal bounty of fall produce and are simple to serve, especially if eating outside in the sukkah. Roasted Carrot, Apple, and Celery Soup: Roasting intensifies the flavors and smooths the texture of the product in this vibrant Carrot, Apple, and Celery Soup. Make the pareve version (sans butter) to start this meat-based holiday meal. 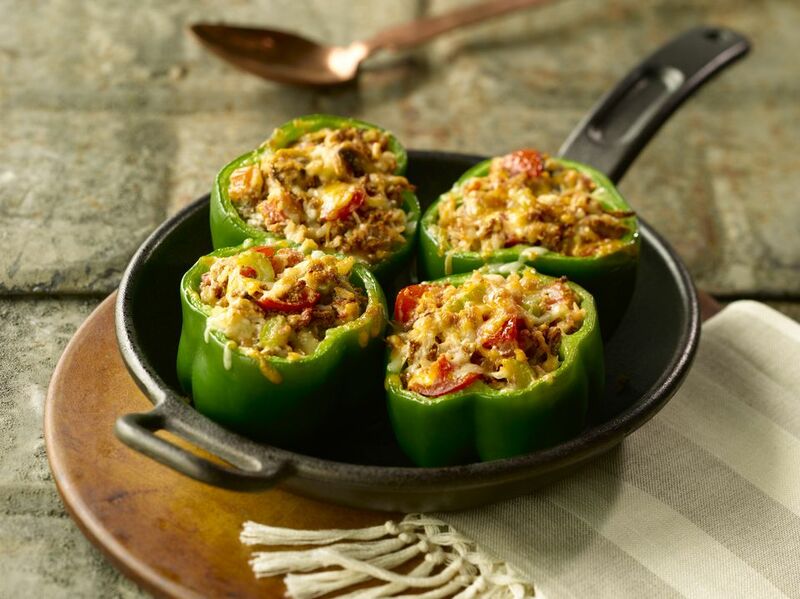 Meat Stuffed Peppers: You can use ground beef or turkey in this recipe from Giora Shimoni. He says "stuffing peppers is much easier than stuffing cabbage leaves, and the resulting dish is just as delicious." Apricot Lime Chicken, Potato, and Broccoli Sheet Pan Dinner: It doesn't get much easier than this delicious one pan dinner. Bonus: cooking the saucy chicken together with the potatoes and broccoli infuses the veggies with flavor. Serve the whole meal on one platter for easy presentation and cleaning. Apple and Dried Cherry Crisp: Showcase fall's new crop of apples in this wholesome, dairy-free Apple and Dried Cherry Crisp. The crunchy crisp topping contains no butter, so the flavors of the fruit, oats, and nuts can really shine through. Lunch in the sukkah can be a wonderful way to enjoy beautiful autumn weather and harvest of the season. These quick and easy lunch ideas are perfect for a simple lunch outdoors. Pomegranate Apple Salad: This sweet-tart treat showcases seasonal apples and pomegranate which both have symbolic significance for the Jewish holidays. Crispy Salt and Pepper Chicken with Caramelized Fennel and Shallots: This elegant recipe couldn't be simpler to put together. Roasted Sweet Potatoes and Beets: With its bright colors and a nice balance of sweet and savory flavors, this easy-to-prepare side dish highlights fall's delicious root vegetables. Turmeric Rice with Golden Raisins: Gorgeous yellow rice studded with golden raisins is tossed in a light umami-rich soy sauce that makes a wonderful complement to this fall menu. Sunken Berry Cherry Cake: Colorful fruit and not-too-sweet cake provide a perfect dessert combination. This simple cake can be made with a variety of fruits, depending on what you have on hand. Looking for more menu ideas? Try a festive vegetarian sukkot menu, featuring a delicious vegan challah, an elegant mushroom soup, a harvest-driven pot pie, and more. And if you've got a tradition to enjoy stuffed foods on Sukkot and Simchat Torah, try something a little different, like Parmesan and quinoa, stuffed mushrooms or kimchi stuffed cabbage. Curious About Purim Food Traditions? Here's A Primer.